Gears are one of the primary sources of power transmission in VEX EDR. 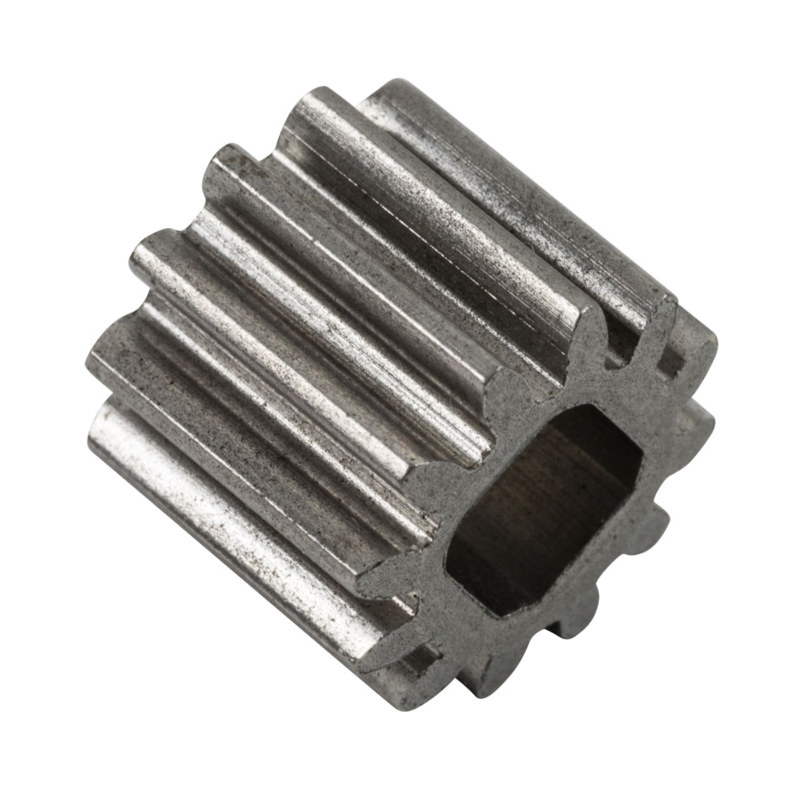 We offer a variety of both normal and high strength gears, that come in a multitude of shapes and sizes. Start with a simple project like building a gear reduction, and work your way up towards building more complex mechanism such as a differential for a drivetrain. More information on gears and power transmission can be found in the VEX EDR Curriculum. This Gear Kit contains additional gears so you will always have the right combination available to ensure you can achieve the desired balance of torque, speed, and direction. To expand your inventing possibilities, the 60- and 84-tooth gears have extra mounting holes. These mounting holes can be used for attaching metal bars or parts to these gears when using them as part of a turntable system, or other similar designs. 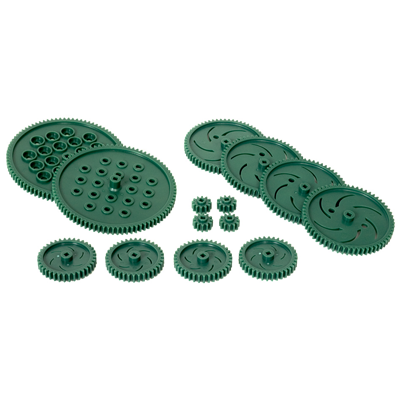 This kit contains four sizes of VEX Spur Gears (12-, 36-, 60-, and 84-tooth gears). The 60- and 84-tooth gears have extra mounting holes for attaching metal bars or parts to these gears when using them as part of a turntable system or similar design. Create robot transmissions, gearboxes, and gear reductions. Vary the speed or torque of robot motion systems. Increase design possibilities for your robots. Build mechanisms capable of achieving higher torque or speed than ever before with High Strength Gears - lift heavier loads and survive bigger impacts with the additional gear ratio options provided by the largest high strength gear available. Metal Square Hosle Inserts prevent axles from "stripping"
Now modified for 1/4" shaft, also includes inserts for .125" shaft. These metal 12-tooth spur gears are great for applications under high shock load or requiring high strength. Look for this update to begin rolling out in the next few months! All metal gear for high strength. Mates with standard VEX gears. 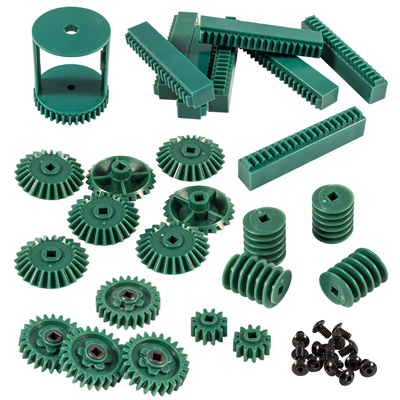 This High Strength Gear Kit provides several new gears with features to handle higher loads. Each of these gears has a wider face width; this means each tooth is wider so applied loads will be spread over a larger area. The 12-tooth High Strength Gear is molded out of powdered metal. The 36-tooth and 60-tooth Gears have powdered metal inserts. 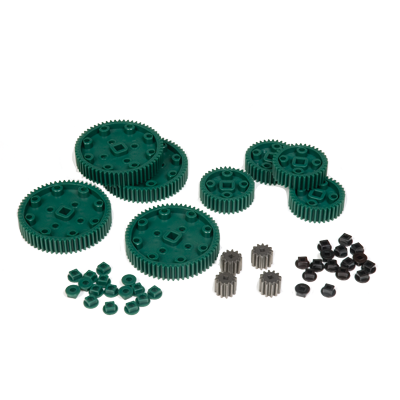 These metallic components will protect the gear from high loads applied by a VEX axle. High strength gears mate with all VEX spur gears. Double-thick face width provides added tooth strength. Metal Square Hole Inserts prevent axles from "stripping". Use metal pinions for high strength where it counts. Use the round-hole inserts to build free spinning idler gears. Build gearboxes that resist high shock-loads. Bolt Gears together for added strength. Rack Gears can be used to turn rotary motion into linear motion. Use any VEX spur gear as a pinion to drive these rack gears. Stack multiple rack gears back to back for longer motions. 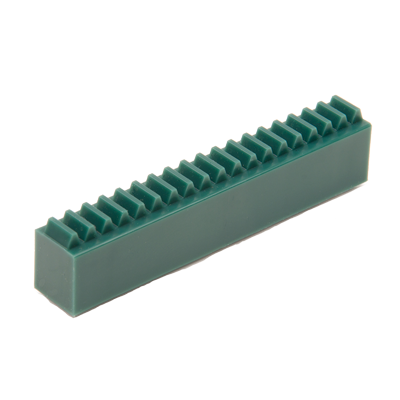 Combine these with a VEX linear slide and Rack Gear Bracket (sold separately) to create a simple linear actuator. Each Rack Gear includes (3) 6-32 threaded inserts on their back face. Mount these similar to VEX motors or servos with 6-32 screws. This Advanced Gear Kit contains several gear types designed to help you build advanced mechanical systems. The rack gear will mount on any VEX metal component and mesh with any VEX gear to create linear motion systems. 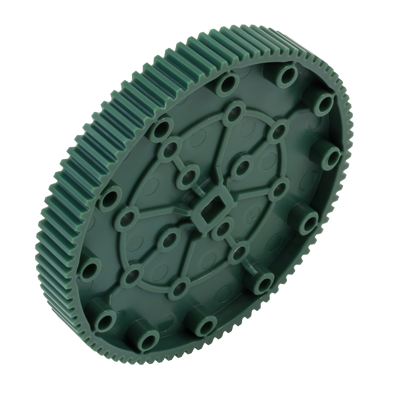 The worm gears allow users to create very high reduction gearing in a small package; these gears will also resist "back driving" which may be useful in some applications. The kit comes with several bevel gears which allow designers to transfer motion "around corners"; you can change the axis of motion by 90 degrees. These bevel gears can also be used with the differential frame to build a differential. This can be utilized to create more efficient "car style" drivetrains. Create Linear Motion with the Rack Gears. Transfer Motion 90 degrees with Bevel Gears. Add a Differential to your Drivetrain. Get a high-reduction with the Worm Gears.